While we are overjoyed about the upcoming changes to Victoria’s Voluntary Euthanasia Laws, our attention is drawn to who should qualify. Understandably, the Government is being very cautious including some very strict safeguards but are these safeguards excluding some of the people the laws should affect. My suggestion is a register like the Australian Organ Donor Register or Five Wishes. People are able to register (16-60) while of sound mind and body about Voluntary Euthanasia decisions if/when they are diagnosed. My father suffered his last years with alzeihmers and was not able to make that decision, neither was his wife. Anticipating I may also suffer from the same disease later in life, I would like to register now that if I was ever diagnosed with “named diseases” or my quality of life was diminished that I wish to end my life under the Voluntary Euthanasia Law. I do not want to suffer, or want my family to suffer because of my condition. Here is a story that typifies the situation for people diagnosed with diseases like dementia and Alzheimer’s. Jayne Francis noticed something wasn’t quite right with her husband shortly after they moved into their new home. Lindsay had always been a good handyman, yet suddenly he was struggling with basic tasks, like adjusting the heater, or turning on the sprinklers. There were also times she’d arranged appointments after work, but he wouldn’t show up. And gradually , his personality changed, too, from the highly engaged lawyer he’d always been, to a man confused, forgetful , frustrated. It took a fair bit of time for doctors to work out that Lindsay had dementia , the cruel and incurable disease that affects about 100,000 Victorians every year. But it took little time at all for the heartbreak that followed , as Jayne and the children slowly watched his quality of life diminish. ‘‘ In the end, he didn’t know who he was, he couldn’t feed himself, he couldn’t talk,’’ Jayne says of Lindsay, who died aged 57. As the Andrews government prepares to introduce laws giving terminally ill people the right to a physician-assisted death, attention has turned to the vexed question of who should qualify – and whether people with dementia and Alzheimer’s disease ought to be included. Under the model proposed, only adults with decision-making capacity , who suffer from a ‘‘ serious and incurable’ ’ condition, and are at the end stages of their life – possibly the final 12 months – are likely to get access to an assisted death. But this leaves people with dementia ineligible. Think of it as a catch-22 : on one hand, patients would have the mental capacity to make a request as the disease is developing , but are unlikely to die within the 12-month time-frame being considered by the government. On the other hand, once they are close to death, they won’t have the mental capacity to request that their doctor provide them with a lethal pill to end their suffering. Health Minister Jill Hennessy accepts that not everyone will be happy by the scope of the legislation, but adds that strict safeguards are vital. ‘‘ Many will be very disappointed that there’s a model that doesn’t include dementia or Alzheimer’s but critical to the security and protections in this model is that a person does have competence and capability ,’’ she says. Others, however, have urged the government to reconsider, suggesting that people living with dementia should have the same end-of-life options as other terminally ill patients, such as people with cancer. 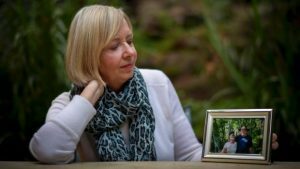 Ann Reilly, the acting general manager of client services at Alzheimer’s Australia Vic suggests this could be done through advance care plans, which would give dementia patients the ability set out their endof-life wishes in a legally binding document during the early stages of the disease. It’s the kind of complexity that is now being examined in other jurisdictions as well. In the Canadian province of Quebec, the government is considering whether to let people make advance requests for assisted suicide, which could give people with dementia access that they have not had since the law came into effect in December 2015. Jayne Francis would likely back the idea. It’s been eight years since Lindsay died (and she has now remarried) but she hopes the government will reconsider making people with dementia ‘‘ part of the conversation’ ’ as the laws are drafted. ‘‘ Obviously you want the guidelines around assisted dying to be really tight, but special consideration should probably be given to people with dementia as they may have to make that choice earlier than someone with cancer or a physical illness,’’ she says. This article by Farrah Tomazin is from the May 28 issue of The Age Digital Edition.